John Lester opened with a keynote on SL. Before joining Linden Lab in 2005, Lester worked with creating online communities for both patients and medical staff at the Department of Neurology at Massachusetts General Hospital and at Harvard Medical School. Lester’s background within Neurology gives him a really interesting take on learning, which in his term is bound by biology. As far as I understand Lester, this means that we as humans used to navigate real life actually may find many strengths and advantages in 3D virtual worlds as a sort of default predisposition. Some of the characteristics of humans such as recognizing patterns, navigating in 3D, communicating with other people, creating communities and using tools do seem very applicable or transferable (not without problems though ;-) From a learning theoretical point of view this really is interesting, and I would love to hear Lester talk more specifically on this! Returning to biology Lester pointed out that our brains appriciate or even demand places and faces, that we crave emotional bandwidth, and that education in SL therefore should be seen at the intersection between people and places reminding us that there are humans behind most avatars. Average age of SL resident: 35 yrs. Next up was Denise Doyle from University of Wolverhampton. Doyle has been involved in The Immersed in Learning Project since the beginning in 2007. Creating the Kriti Island has been part of this project in order to have a place for collaboration both nationally and internationally. Kriti Island has also hosted a very successful artist lead project on Reality Jam – an interactive exhibition contemplating creative practices. Doyle has a special research interest in interactive narratives and is using SL as a place for experimenting with different theoretical concepts and as a teaching and learning tool in undergraduate programmes in Digital Media. Jeremy Hunsinger, from the Centre for Digital Discurses and Culture, Virginia Polytechnic Institute and State University, whom you may know from the weekly SLEd Lessons in Second Life, did a talk on Interaction and Interactivity in SL pinpointing the many boring, non interactive builds in-world and addressing some of the technical problems students may encounter when entering SL. Hunsinger reminded us what a dreadful experience SL can be if it is cluttered by technical problems and if you only explore the world on your own. I agree that SL is best experienced together with others. SL is about collaboration and community first and foremost. So many places in SL are still just pointless replica of RL with no interactivity other that clicking on notecards or being redirected to out-of-world websites. I do feel that realistic rebuild can be appropriate, but respectful remediation just shouldn’t be the prevailing principle for in-world learning design – where is the innovation in that? Final speaker of the day was Kim Holmberg from the Department of Information Studies at Åbo Akademi in Finland. Holmberg is an expert in social media and Library 2.0 and was the first university lecturer to use SL in education. Holmberg reported from a study he did together with colleague Isto Huvila, where they used SL as an alternative learning platform in distance education. 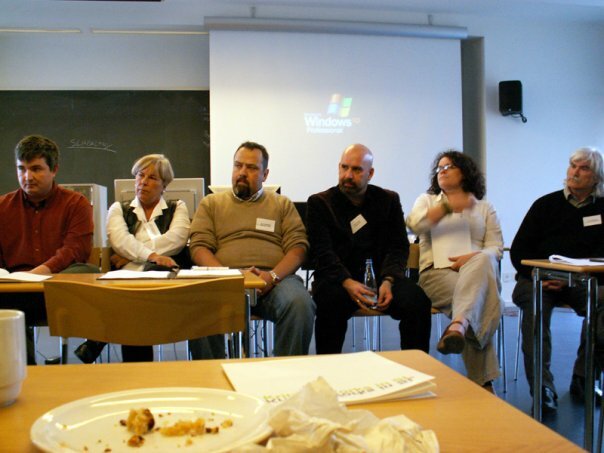 Holmberg and Huvila found that SL cannot replace face-to-face, but as an alternative platform SL proved to be more “fun”, and they wish to study this particular aspect further. Holmberg was very interested in the avatar phenomena and how this kind of representation influences the learning processes. Holmberg also focused on the fact that we persist (especially as newbies) on bringing RL behavior into SL even though it doesn’t make much sense – e.g. when we sit down or face the one speaking. In this aspect, I think Holmberg’s talk supplemented Lester’s initial ideas of biological and cultural predispositions very well. Summarizing the many interesting talks and discussions isn’t easy, but I was personally confirmed in some of my own findings and I was reminded of the complexity of design for learning (in general!). Fabulous update Mariis! Wish I could have been there.